Access Crown gives more quality for less! 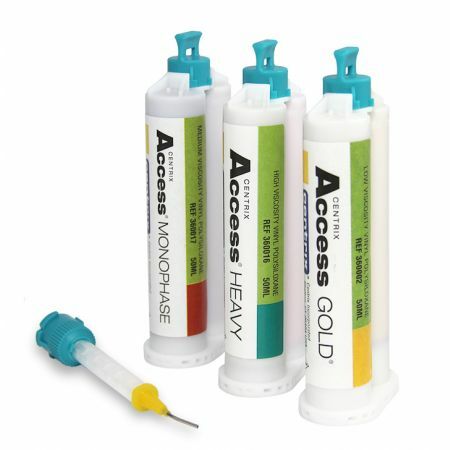 Access Crown is the easiest and fastest bis-acryl temporary resin material. Its unique elastic polymerization characteristics (“memory”) enable it to be pulled from undercuts or non-parallel preps and to return to its original form. Its high flexural strength provides superior performance during function. * Not a trademark of Centrix, Inc. The kit contains one 76-gram cartridge plus 10 SuperMixer™ mixing nozzles. We invite you to watch how to create a fast, strong and highly esthetic temporary bridge using Centrix Access Crown. In this video, the patient presents prepped ready for a maxillary 5-unit anterior temp bridge. We get it done in 60 seconds! Waste less and get more! Up to 38% less waste or avg. 38 more temporaries out of each cartridge with Centrix SuperMixer™ Nozzles. Keep patients scheduled in production time, NOT emergency visits by using NoMIX moisture activated take home cement! With your drills and skills and our innovative materials together, We make Dentistry Easier! Why is there an inconsistency between Crown shades and Vita shades? There is an inconsistency in our Access Crown® shades in comparison to the VITA shades. The VITA shade guide is based on porcelain and ceramic materials, not glass-filled resins. Porcelain and ceramic are opaque materials while bis-acryls are not. Why won't Access Crown set? Given enough time, the glass filler in Access Crown can gradually settle to the bottom of the cartridge. Actually this can happen to the filler in any fluid or semi- fluid resin. It will take much longer with viscous materials. In order to guarantee the same setting times throughout the use of a single cartridge, we recommend that you store the cartridge horizontally, or on its side, rather than vertically, standing on its end. But if it has been sitting on a shelf for 6 months or more, the cartridge needs to be shaken before use. Why did my temporaries break or fracture? Access Crown may have been left on the prep too long, specifically longer than one minute. This is the problem as the material has passed the doughy consistency set stage and has become hard and brittle. When the doctor removes during the brittle stage, he/she has the potential to damage in inner-mechanics of the temporary, which will lead to breaks and fractures. This material is the fastest setting bis-acryl material on the market. It does not behave like its slower competitors. Why are there air bubbles by the cusp of the temp? Getting air bubbles by the cusp usually denotes that the matrix for the Crown was not filled from the bottom up. Place the tip of the mixing nozzle at the bottom of the impression and hold it there as you express the material and fill the matrix. Can you use Access Crown with pre-formed crowns? No. Access Crown and pre-formed crowns do not share the same chemical properties so that there is no chemical adhesion, which is what the doctor wants. All Access Crown shades have fluorescence, which allows temporary restorations to reflect light more like natural teeth. How long do you leave Access Crown in the mouth to set? You can remove it in about 1 minute. It will be flexible, without tearing. This is the most attractive feature about our product; other materials are much slower, and do not have this time-saving "elastic phase". Should Crown be used with people allergic to plastic? No. Access Crown is a urethane dimethacrylate, which is a plastic resin. Any material with "acrylate" in its chemical name is a form of plastic. Most temporary crown and bridge materials are a form of plastic, including pre-form polycarbonates. Patients with plastic allergies should avoid temporary crowns all together. What are the specifications of the mixing nozzle? Access Crown uses 1:1 Automix Nozzles. The internal diameter is 3.2mm; it has 12 elements; and a tapered end. The hub is light blue; and the mixing element is natural or clear. What can you use to fix breaks in Access Crown? Any flowable composite like VersaFlo. Once the oxygen-inhibited (smear) layer is removed, the temporary crown must be etched/bond before applying flowable composite to repair. If the smear layer is still there, you can apply more Access Crown without having to etch and or bond. Why is it sticky or greasy after one minute? All temporary crown materials have an exothermic reaction once mixed. As Access Crown is one of the fastest setting materials, it will have a thicker oxygen inhibited (smear) layer. While noticeably different than slower setting materials, one great benefit to our smear layer is that you can add more Access Crown to set Access Crown without the need for etching and or bonding. Does Access Crown cause gum tissue ulcerations? This is not a reaction we have seen before. Note: it is not a chemical burn. It could be that the patient is sensitive to resins/acrylics, but this is unlikely. While prepping the tooth with a burr, some irritation may have occurred to the gum tissue. Also depending on the matrix, the crown may be bulking so that it is too large and is irritating the gum tissue. Take a pre-operative impression, using Access® Blue Vinyl Polysiloxane or alginate impression material. Interdental excess should be trimmed from the impression. This ensures a strong interproximal area. Cut away additional impression material to alter the shape and thickness of the provisional if needed. When constructing a temporary bridge, the pontic area can be removed from the impression in order to create a pontic in the temporary bridge. The abutment teeth are then prepared and extraction is made. NOTE: Always bleed after mixing tip is placed! 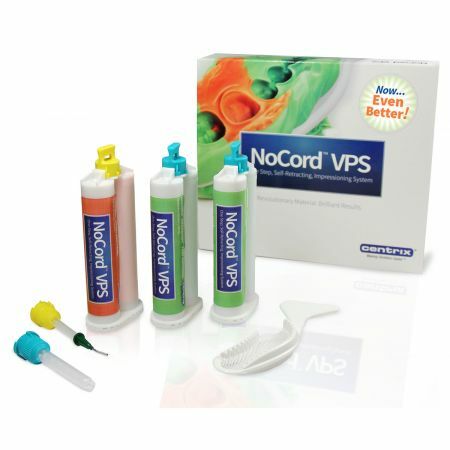 Blow dry impression and fill with Access® Crown at the required preparation sites.Fill from the bottom up. After the Matrix is 3/4 full (within 30 seconds) position it in the patient's mouth. 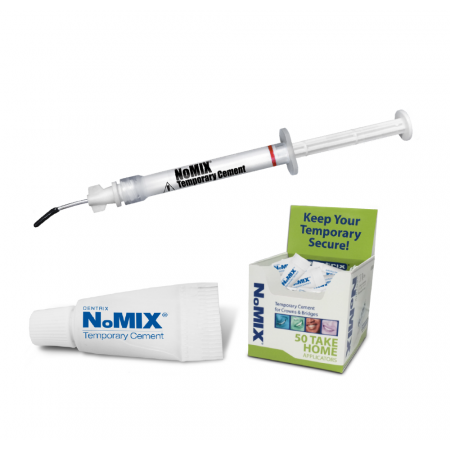 Allow Access® Crown to set undisturbed for 60 seconds (90 seconds from beginning of mix), then remove from mouth. 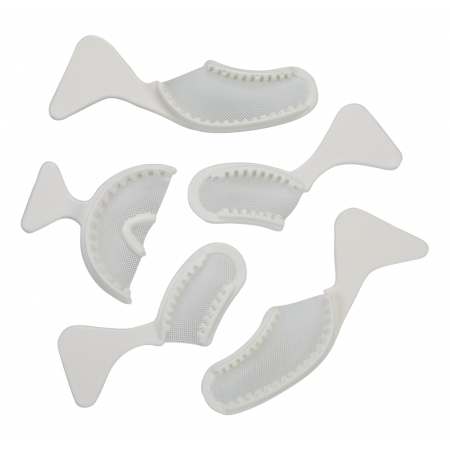 The material will be in a rubbery, doughy consistency and will pull over any undercuts or non-parallel preparations. The material will generally cure in 3 1/2 additional minutes, however, you may hasten the set by submerging the Access®Crown temporary restorations in a hot water bath for 30 seconds. Remove from Matrix and trim excess flash with crown and bridge scissors or diamond bur. Remove smear layer with alcohol wipe. If proper care has been taken in preparing your crown, little or no mesial or distal trimming will be needed. If trimming is necessary however, a fine grit diamond bur is recommended. If polishing is desired, use composite glaze, pumice, rouge or a diamond polishing system. Cement with any Access® temporary cements, or any non-eugenol cements. Rinse and air-dry Access® Crown temporary. Gently roughen with diamond bur. Blow dry to remove surface powder, then wipe clean with alcohol. Apply composite bonding agent and light cure for 10 seconds. Contour the matching shade of VersaFlo® into defect and light cure for 10 seconds. If additional adjustments are not needed, remove from the mouth and light cure for an additional 30 seconds. Allow to set.